The Faeries scatter as petals on the wind. Someone was coming. It’s smell was disconcerting; like a human, yet like sweet milk, yet like lavender. This was not the smell of the besotted human male, staggering from the pub with two too many pints in him. His would have been an odor they were accustomed to. They knew what to do with that type. Always looking for Leprechauns. Usually mumbling something about ‘changing their luck’. Hiding amidst the woodland groundcover, one after another they took turns peeking for a glimpse of the interloper. What kind of creature would dare this far into the grove? The Fae had chosen this spot specifically for the privacy it offered. The trees here grew thick and dark, creating a frightening specter most humans dared not enter. Rounding the bend, the human child pushed her way through the undergrowth. Her stubby little arms pushing the tall ferns aside. She seemed to be making her way to the stream. Flying low, staying out of sight just under the fern fronds, Juniper flew taking careful inspection of the human child. Not wanting to be noticed, he took on the flight characteristics of a dragon fly. Hovering and darting, he noticed much detail about the human. The human had few but small teeth. The human had pudgy arms and legs. The human had rosy cheeks and hair the color of corn tassels. It seemed to stagger more than walk. It didn’t appear to know that the forest is dangerous. Reporting his findings back to the elders, it was determined this was a human child. The elders also reminded all of the clan, that where there is a young human child, an adult is sure to be nearby. Patrols were dispatched to locate the adult. Once the patrol found the adult, they were then to ascertain whether male or female. The elders began preparations to lure adult humans to the human child. The women would be easily led to the child; one of the Faeries would simply lure her into the forest with cries simulating the child. The men would be more difficult, unless the whole town was looking. Then it could be a catastrophe! They may come beating the underbrush with machetes, cutting down Faerie homes and buildings. They would tramp all over their finely cultivated mushroom gardens. Luckily, the wintergreen berries wouldn’t be fully ripe for few more weeks. They would call and call the child’s name, out-yelling one another, so loudly they couldn’t possibly hear any return calls. Adult humans have no consideration to any other than themselves. Juniper and his patrol zigged and zagged along the edge of the forest. There was no sign of any humans. Juniper sent one of his sentries to fly to the top of a hill and check further away from the forest edge. The sentry, Ivy, set her wings in motion flying quickly to the cover of a small choke cherry tree. The underbrush was thin here with little cover should a hawk or an owl appear. Ivy did not want to be invited to their next meal! Scanning the area with her binoculars, Ivy saw no movement of humans. Then she spotted the leg. There sticking out from a small dip in the side of the hill, was the foot and lower leg of a human, lying down. Signaling back to Juniper, she signaled there might be a problem. The entire patrol skimmed their way to the choke cherry tree. Buzzing amongst themselves, the speculation as to why the obvious female adult human would let her child wander away, for that long, began to escalate to a high pitch. Their deliberations began to sound like a cicadae. Juniper shushed them. Drawing to his full height, puffing out the chest of his green tunic, he began his flight to where the adult female lay in the grass. Weaving from cover to cover, it took much longer to get to the dip in the side of the hill where the woman lay. Carefully, Juniper landed and peered in her direction, several time during his trip. Danger lurked everywhere. Juniper imagined snakes and toads and birds during each leg of the flight. Each time he landed, he unsheathed his makeshift sword. Unsheathing the blue plastic cocktail garnish spear, Juniper held it aloft. He cried out to the Fae to protect him by empowering his Sapphire Saber . Thus building his courage, he moved ever closer. At last able to see more than just the calf and foot of the woman, he could see she was not breathing. He could see there had been some sort of struggle and the woman was no longer alive. His heart went out to the woman and her small child who was now alone in the forest. It was human business. Juniper searched the horizon for other humans, again. He saw none. The blood on the woman’s clothes was black and flies were lazily buzzing. There was nothing the Fae could do to help her. Juniper, Ivy and the rest of the patrol quickly flew back to the safety and cover of the forest floor. Comparing notes among the patrol, they efficiently pieced together their report for the elders. Once back at the encampment, Juniper gave a full detailed outline of what they encountered. Without hesitation, he asked who had been sent to watch over the safety of the human child. A child safety patrol had been assembled from those who had experience in the camp’s daycare. Along with several young Faeries, an Elder, Blossom, who was a Sister-Queen of their court, went to check on the human child. Blossom had much experience, in her day, with humans. Blossom would know what to do, if anything. Juniper and Ivy dashed to where they had last seen the human child. Flying as two dragonflies, zipping through the underbrush and over the brambles. Two forest green dragonflies. Veering direction, they both heard the cries and followed. There on the bank of the stream, the child had fallen. Her knees were skinned, her hands were muddied, and her little face had rivers of tears streaming through the dirt smudges. She had fallen down the incline to the stream. There was no chance she would drown, as the stream was only a trickle. Hypothermia, that was the real fear of everyone gathered around her. Blossom chided the others, “Now make sure you stay out of her reach. She is a baby and doesn’t know when she has hurt you.” The Faeries surrounding the baby tried darting back and forth to distract the human child from her pain and loneliness. Juniper reported his findings to Blossom. Shaking her head and tut-tutting with her tongue, Blossom conceded the dire straits of the young human. Blossom told Juniper the human child appeared to be female. The child appeared to have recently learned to walk, therefore would be less than two years old. Blossom’s eyes began to well up. “No mother to care for you, oh child. Whatever shall become of you?” Rocking back and forth, as though she already held the child in her arms. Ivy nodded in agreement. Ivy buzzed near the child and back away, grabbing the little girls attention. Just as Ivy flew back to Blossom, Blossom released the spell along with the Faerie dust. Within seconds, the human child had reduced in size. “Quickly Ivy, bring the little one to me.” Ivy swooped into the baby clothing, grabbing the now wailing child out. Ivy dashed to where Blossom hovered, waiting with arms outstretched. Holding the small child close to her. They flew back to the encampment. Juniper in the lead and the rest of the child safety patrol all surrounding Blossom and the child. “Blossom!” Maude. Queen of all Faeries. Maude was here, at our encampment? Why? Had she been called? Over a human child? No, the human child was just a coincidence. Blossom carried the human child in her arms, into the Great Chamber. The chamber where all the Faeries gathered for camp meetings. Handing the baby over to a nursery Faerie, Blossom straightened her emerald green gown and curtsied to Queen Maude. Every Faerie under the protection of Sister Queen Blossom wore some variation of green. Queen Maude, her gown bespoke her title. Woven spiders’ webs, the indigo bodice was lace extraordinaire. There was enough ornate lace, you could not tell where the ties were hidden. Her skirt billowed as though made of an upside down iris, color matching the bodice. Her slippers were studded with diamonds which glistened as she walked. Complete with a purple under slip, just showing enough to prove she matched through and through. “I thought we would keep the baby with us and safe until we can find alternate keeping for her. Preferably humans.” Blossom said quietly. “Oh, so the human child is a female. I believe the right to name any new child is mine. Any objection?” Queen Maude cast an eye about the room. Faeries looked back and forth among one another, glancing first this way and then that. In the end, they each began shaking their heads. “Oh Maude, we would be honored if you would name the human. Shall you name her now? Or could we incorporate that honorific splendor into our Solstice gala?” Blossom was clapping her hands with joy. This meant that Maude was going to allow them to keep the baby. Babies hadn’t been plentiful in a very long time. 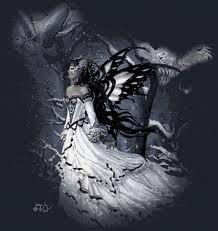 If a human child lived within the Fae for twenty one years, it became a true Faerie and earned the right to wear wings. It would be a wonderful way to increase the size of the camp and hopefully continue Faeries in general. “Now, Maude.” Blossom began, “You know as well as I do, there are too many underlings ahead of this one in the secession to the throne. You will spin your kingdom out of control. You will have each of your heirs at one another’s throats even more than they already are. We cannot afford any more wars. The Faerie population is nearly depleted. We need to live in peace for a while, gather ourselves unto one another, increase our food stores, care for one another.” Blossom placed her hand lightly on Maude’s knee. Maude seemed to hear Blossom, for she sat back in her seat and the glint in her eyes seem to fade somewhat. In her designated dressing room, attended by her ladies in waiting, Maude began to smile into the mirror again. “Lillie. Her name shall be Lillie. She will be of the Indigo and the Green Courts. She will be far greater than any expectation.” Maude reached to the hidden drawer, pulling out the bloodied knife she had used to make the child available…..
Oh Maude, queen or not, you are a naughty one! Grat story! Very well done. Thank you for telling me it's great - my husband usually just looks at me, furrows his eyebrows and shakes his head....this is what watching too many cartoons as a kid can do!! lol. This was fascinating! You have an amazing imagination. It has come from hanging in the writing rooms with folks like you and Jo and Jenn and the rest. Thank you so much. It does mean a lot to me. Love the twist at the end! I dig the parallel universe within our world storyline too. Thank you Steven! Growing up with the original Grimm's Tales - I'm more than a bit twisted! Thank you so much for taking the time o read my story. Thank you for taking the time, I know, it was rather long for this venue. Thank you.